Hope you have (or had) a great Halloween. Btw, the dialogue in the first couple of panels was tweaked A LOT in response to all of your comments over the last couple of strips. Thank you for the feedback, I really think it helps me make Spacetrawler a better strip. MAD is the news this past week I guess. 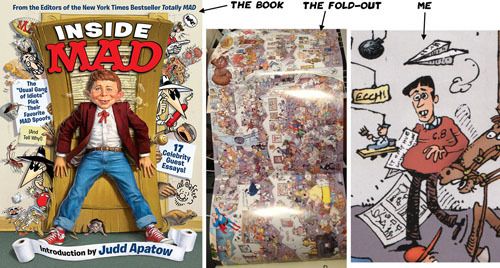 So, they just put out a book called Inside MAD: The “Usual Gang of Idiots” Pick Their Favorite MAD Spoofs collecting favorite staff picks. In it is a Don Martin strip I picked and briefly talk about. Also is a strip i did, mentioned by Jon Bresman. ALSO in it is a “fold-out” comic of all staff drawn by Sergio Aragones. He was a huge influence on my early comicking (both from MAD and his comic book “Groo”), and so it was pretty special to see me in there drawn by him. My girlfriend and I had a good weekend. Visited friends and family and spent an afternoon wandering around Shelburne Falls which is one of those little towns that are so ideal that it hurts. By the way, 500 self-restraint points to anyone who DIDN’T go back and look at Garzun twiddling with her ring. I had to. @TB, ha! Yes, I should have actually put in a link to Garzun twiddling her ring, or later, her missing her ring. Emily definitely noticed that Garzun was wearing a ‘Ring of Foreshadowing!’. Glad I didn’t before checking the links. The pen is mightier than the sword. Especially in the hands of someone who has the speed and the weapons training. 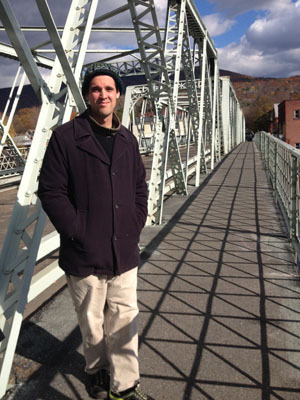 That looks like Clarence’s bridge (ref: “It’s A Wonderful Life”) in the photo. Panel 7: robot face. It cannot now be unseen!